Home Built DIY 3 DOF Flight Simulator Motion Platforms - Visual system motion driver. 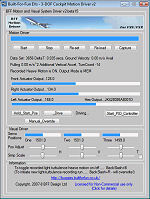 Recently I've been working on a exciting enhancement to DIY flight motion simulation. 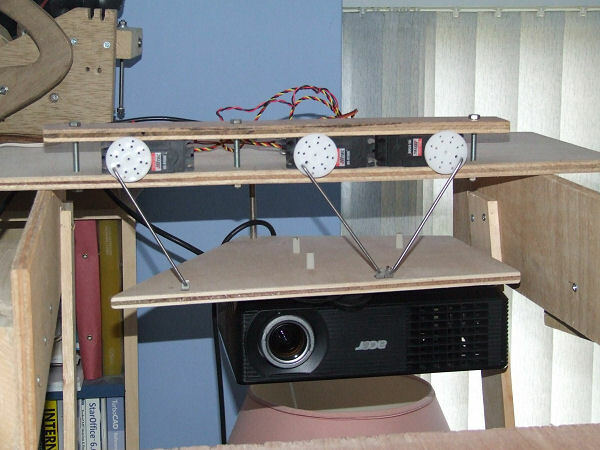 It is a technique that looks well suited to low-cost DIY motion projects that has been developed by Professor Bill O�Riordan of ORB Research here in the UK. 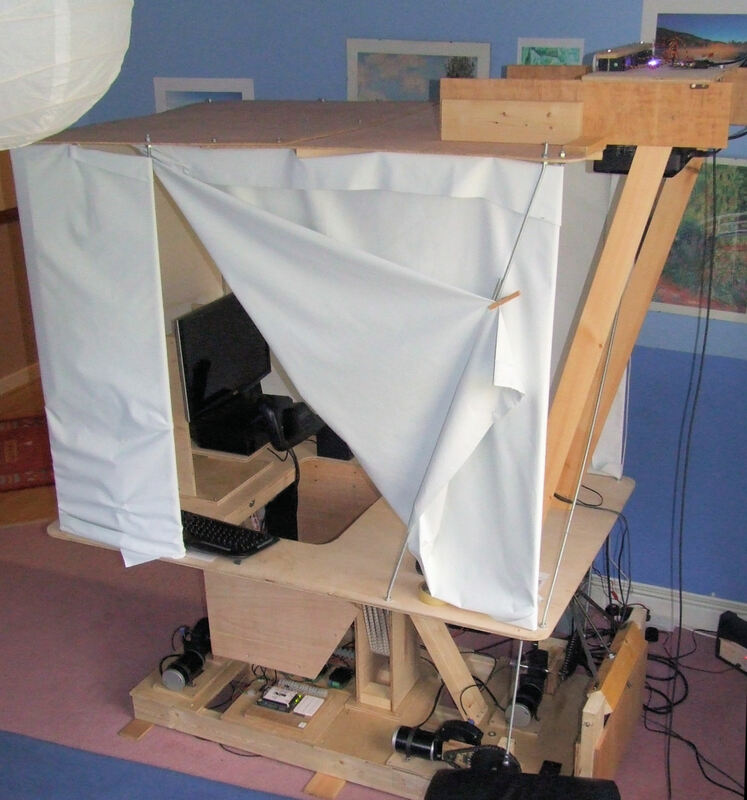 The simulation enhancement involves manipulation of the flight simulator's projected visual display in order to induce and/or intensify the impression of motion experienced by the pilot. The ORB Research technique is to make controlled, often subtle movements to the entire projected scene in front of the pilot which, together with the platform motion, further tricks the pilot into thinking that he/she is actually in motion. The movements of the visual display are driven from flight data extracted from the flight sim program in a similar way to the main platform motion drive and are therefore coordinated in real-time with the motion of the simulated flight and the platform physical movements. This projector articulation technique is still at a fairly early stage of development however strong immersion effects are reported by ORB Research and there is clear potential for the method to be used with a small displacement motion platform to add to the options DIY'ers have for low cost but effective motion platform projects. I do know that the projector articulation method when running on my Platform 3 design produces an immersion level that scares the life out of my wife - she seems convinced in her efforts to control the aircraft that she is actually in the air even though the scale of the movements produced by the motion platform are quite limited. I find that the effects do indeed enhance the motion immersion. Clip 1 shows the typical visual effects during takeoff in a light aircraft - first a couple of runway turns to show the yaw effects and then the takeoff. Clip 2 shows the effects during level flight in a heavy storm so the movements are a good deal more pronounced than those apparent during normal flying - but they make the motion clearer for the clip. There are two ways to view these clips. The first is to concentrate on the "fixed" scene - say the LCD monitor below the projected image, this way you clearly see the display movement. The second is to concentrate instead on a scenery object in the projected display - a tree, building or coast line say. When I do this the display movement seems to reduce in intensity and I'm drawn into the simulated motion. You can imagine that when the projected display occupies most of the visual scene in front of you and it is combined with physical movement of the platform the immersion effects might be quite strong. 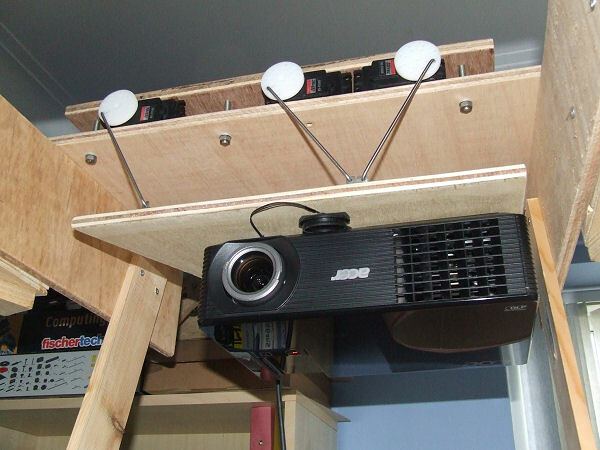 Modern projectors are generally quite compact and light and the physical mechanisms required to move one can be fairly simple. Indeed on my implementation, and on the ORB Research development rigs I've seen, conventional RC type servos are used with simple mechanics and drive hardware. 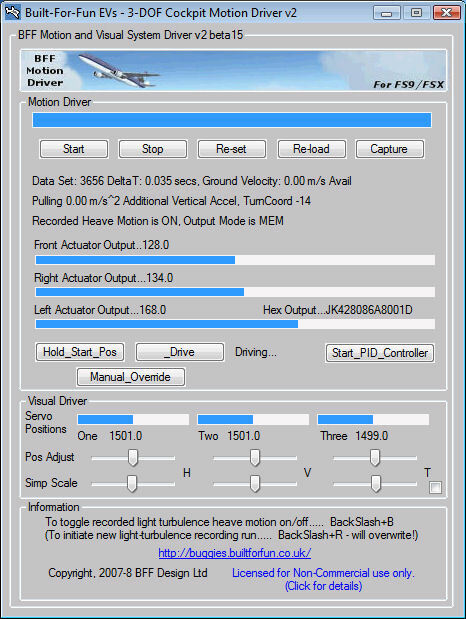 A trickier element (as always) is the real-time extraction and processing of flight data to develop the projector's motion "cues" and in my work I've implemented this as an integrated feature of v2 of the BFF Motion Driver software. I opted for a partial Stuart type mechanism for the projector drive mechanism (shown above). 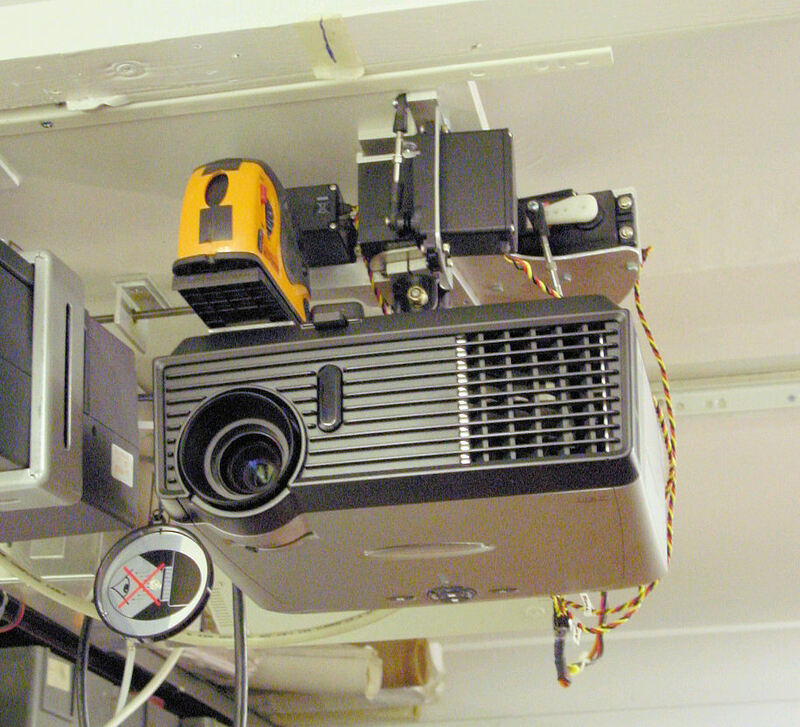 In this the projector is hung from a stiff plywood plate which is supported at the rear on a ball joint. Three servos support the front of the plate through a triangulated Stuart type arrangement of tie rods and can drive small vertical, horizontal and tilt movements of the projector using "coupled" motion cues from the v2 BFF Motion Driver. These movements are magnified by the projector "throw" and are reflected in the projected display. I've used a Pololu Servo Controller to drive Hitec HS-815BB servos. 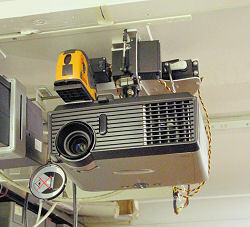 The image right shows an ORB Research prototype rig which uses independent (uncoupled) servo drives for each of the degrees of movement of the projector. The ideas described here are at an early stage of development but I think they have good potential for DIY builders and particular thanks are due to ORB Research for making the ideas available to the DIY motion platform builders' community. There are issues regarding the optimal settings for the display motion cues and this needs further testing and tuning. Other development questions relate to what is best to include in the projected display - should it be an external view solely, or is it better to include elements of the cockpit structure (eg a partial virtual cockpit view). I find the latter has a better effect as it seems to provide a visual reference which holds the attention of the pilot and better allows the mind to accept the implied motion. A couple of other matters to think about are the nature of the interaction between the moving projected display and any "real" fixed cockpit panels there may be and also how to deal with multi-projector setups. Copyright © 2008 BFF Design Ltd All Rights Reserved.